The death of Margaret Thatcher yesterday [April 8] will not, unfortunately, signal an end to the damaging policies she introduced and implemented in Ireland, Britain or elsewhere around the globe. Already, the media, various political parties, and others have sought to portray a less than critical view of the legacies from Thatcher’s era. In Ireland, most people will remember Thatcher as the person who condemned Republican prisoners to death on hunger-strike in 1981. But, the truth is, she represented much more than that. Margaret Thatcher viewed the Six County statelet as a colony of Britain and treated it with the same disdain and contempt that all imperialists have for their territorial possessions and for all those who reside therein. The embracing by Thatcher and her ministers of a previous British government’s policy of ‘Ulsterisation, normalisation and criminalisation’ led directly to the hunger-strikes of 1980 and 1981, and the long drawn out agony endured by prisoners’ families and by communities across Ireland as, one by one, ten men died in a defiant and defining prison struggle. 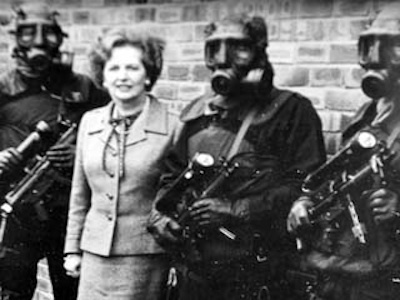 From 1979 until 1990, Thatcher’s policies in Ireland gave rise to the ‘primacy of policing’ and the policies of ‘shoot-to-kill’ implemented by the RUC and by covert British Army units; gave a central role to MI5 within the Six Counties in formulating counter-insurgency policy; led to the formalisation of the policy of ‘collusion’ and the re-arming of unionist death-squads and their direction by the British state; the use of lethal plastic bullets; and the introduction of an unwritten policy of immunity, still in existence, for members of state forces and their agents involved in the murder of Irish citizens. Thatcher epitomised the mindset of the right-wing political and military establishments in Britain who, like others before, believed that the use of force, coercion and terror could bring about the defeat and demise of a legitimate popular struggle being waged in pursuit of Irish freedom and a yearning for the creation of a society wherein all citizens would be treated equally. While she failed in achieving her objective through those means, Margaret Thatcher also came to a more circumspect conclusion that if the popular struggle could not physically be defeated, it should be a brought to a point where that struggle could be compromised, neutered, bargained with and, ultimately, directed into a disempowering and divisive cul-de-sac. Thatcher - and not Major or Blair - commenced that process, the legacy of which remains very far-reaching today. It is a legacy which must be overcome. In Britain, during her eleven years in power, Thatcher privatised and dismantled previously nationalised industries. Her period in office was marked by massive social unrest, industrial strife, high unemployment and a growing gap between rich and poor. Her 1979 election victory was a day of jubilation for the rich. On polling day, the London stock exchange enjoyed a record day as #1,000 million was added to the share index. Under her watch, the richest 1% grabbed over one fifth of Britain’s total marketable wealth. The seeds of the current global economic crisis were sown by Thatcher and her government through the culture of greed and selfishness they promoted. According to Thatcher, the expertise of the private sector, led by the banks and the City of London’s financial quarter was the alternative to needing an industrial or manufacturing base. Those neo-liberal policies pursued by Thatcher and by Ronald Reagan in the US during the 1980s were later adopted by most western governments, many of which are now experiencing economic disaster. The response of those governments has been to introduce widespread austerity budgets similar to those which Thatcher directed against the poor in the 1980’s and which decimated public services and caused mass unemployment in Britain. In 1982, when the right-wing Argentinian military junta invaded the Islas Malvinas, it gave Thatcher an opportunity to launch a short but vicious war as a timely distraction away from her economic and social policies. It mattered little to her that the war would leave behind 255 British and 650 Argentinian dead. Thatcher infamously justified the sinking of the Argentinian ship, the Belgrano, with great loss of life as it retreated from the battle zone. But her relationships with authoritarian regimes were not always as hostile - as Thatcher’s defence of and her long personal friendship with the former Chilean dictator, General Augusto Pinochet, illustrated. She also defended apartheid in South Africa, gave unstinting support to Israel and armed and supported other undemocratic regimes. Thatcher completely emasculated the trade union movement with the introduction of no less than eleven separate anti-union laws and measures. Her anti-union stance culminated in the miners’ strike in the mid-1980s when the miners and other trade unions stood together in solidarity as they battled for the very survival of working class communities while the full force of the British state descended upon them. Almost three decades later, across Wales, England and Scotland, there are towns and villages that have never recovered from Thatcher’s orders to close the coal mines, irrespective of the long-term social consequences of that decision. Many of those towns and villages had their hearts ripped out. Today, they remain abandoned places as monuments to Thatcher’s legacy. In Ireland, Britain and around the globe, there is little to be mourned by Thatcher’s passing; even less to be cheerful about. The Six Counties still remains under British control and partition is now endorsed by constitutional nationalist parties across Ireland. Unemployment in the Six Counties has reached levels not witnessed since Thatcher’s era and poverty continues to increase. Working class communities remain under attack. Thatcher’s legacy also extends into the Twenty-Six Counties. The policies implemented by successive Leinster House parties today differ little from those implemented by Thatcher in the 1980s in Britain - penalising the poor, the working class and the less well off while rewarding the wealthy. Tens of thousands of unknown people in countries throughout the world also died on Monday - from poverty, starvation, lack of drinking water, lack of basic medicines - just like the tens of thousands who will die tomorrow and the next day and the day after that. Thatcher personified the capitalist system of greed which, in conjunction with imperialist exploitation and control, has ensured the concentration of wealth and natural resources into the hands of a small, selfish and self-serving minority at the expense of the majority. That is true globally. It is true on this small island. Thatcher is dead. Capitalism and imperialism are not. Unless we set about the effective destruction of those unfair and unjust systems which she and others of her ilk have helped to maintain and which are still in operation in Ireland and elsewhere today, there is no reason to celebrate. But there is ample cause to resist injustice and inequality, to rebuild solidarity within and among communities both globally and domestically. And here in Ireland, there is ample cause to again reclaim and re-assert the spirit of freedom - the one solitary thing which Thatcher could never destroy.